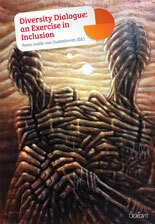 This Diversity Reader represents a dialogue on equity and inclusion and the struggle for the promotion of social justice in different contexts. It is an enthusiastic plea for the ownership of social responsibility on an individual, institutional and societal level with the recognition that many of us actors in the field are bound duty-bearers. Dr. Jualla van Oudenhoven, editor of this book, is a sociologist attached to ICDI – International Child Development Initiatives – in Leiden, The Netherlands, and is currently involved in social justice advocacy within a North American and international context. She is the Diversity and Inclusion Consultant at Durham College, Ontario, Canada and continues to contribute to the debate, policy and practice regarding interventions benefitting vulnerable persons. List of contributors: Megan Katherine Ali, John Edward Charles Cooper, Natasha Dias, Jeff Haskins, Barbara Howe, Preeti Nayak, Anna Augusto Rodrigues, Jessica Stoiku, Rona Jualla van Oudenhoven.